4 September, 2014, Apia, Samoa - Amidst resonating drum beats, cultural island dancers and with the attendance of the reigning Miss South Pacific, the Cook Islands launched 'Vital Harbours' a short film that makes up part of the Vital Series developed under the Pacific Adaptation to Climate Change Project at the Third International Conference on Small Island Developing States in Samoa this week. Sharing the story of the PACC project in the Cook Islands, the short film launched by the Prime Minister of the Cook Islands, Hon. Henry Puna, captures the work that was carried out to construct a harbour for the island of Mangaia. "In the Cook Islands, in the aftermath of the devastating force of five cyclones in 2005, it was absolutely vital to act swiftly to address the vulnerability of our Outer Islands’ infrastructure." "Reducing the risks from tropical cyclones and rough seas was trialled in the design of the new Mangaia Harbour in 2010. Our team of engineers worked with climate scientists to improve not only the strength and durability of the harbour structure, but to improve on its operational features. The completed project was officially opened in late 2013," stated Hon. Henry Puna during his launch speech. "With the success of the Mangaia PACC project, the harbour is now expected to withstand rough weather and longer term climate changes. Boats and canoes can sail into and out of the harbour safely, even in rough conditions where the wind speed is above 15 knots. In the coming years, we will learn more from the Mangaia Harbour, with the aim of improving our outer island harbours and adapting these for climate change. In fact, the methods and approaches we have used to rebuild the harbours for Avatiu, Mauke, Mitiaro and now Mangaia, are being used and replicated for the upgrade work on other Cook Islands' harbours – Manihiki and Penrhyn. We are keen to share these lessons and experiences with all the island countries, and I take this opportunity now to congratulate all our Pacific colleagues in their efforts to pursue similar adaptation measures." 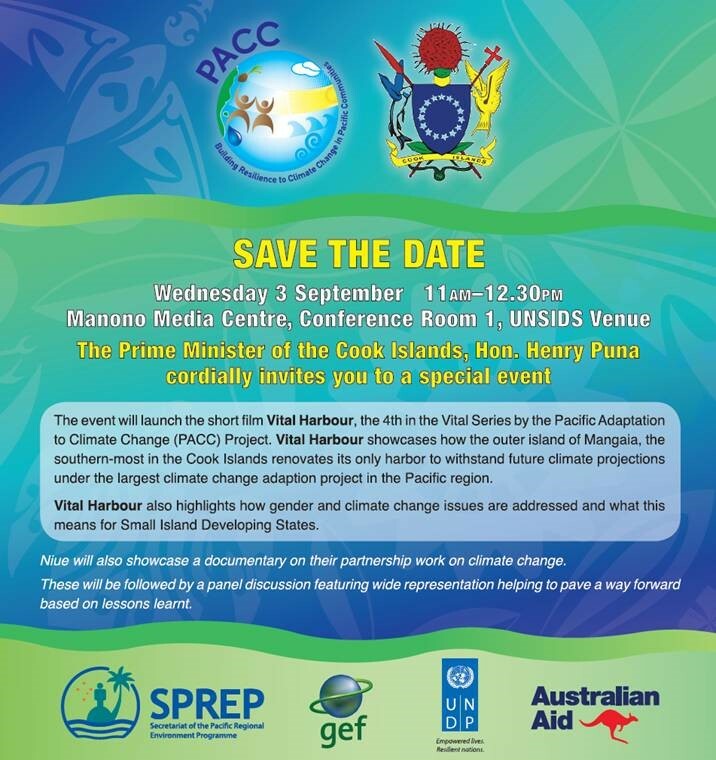 The launch event not only showcased the video from the Cook Islands but also from the Niue PACC Project which strengthened access to water on the island nation through a number of different activities including the production and distribution of water tanks. Presenters that made up the panel of the side event included Dr. Netatua Pelesikoti of SPREP, Mr. Haoliang Xu of UNDP, Dr Josie Tamae of Niue, Mr. Haden Talagi of Niue, Mr. Paul Moate of the Cook Islands and Ms. Tuaine Tuara who represented the private sector in Mangaia. The topics discussed addressed the practical challenges of the infrastructure and water sector to adapt; incorporating gender into climate change; use of climate information in decision and policy making and partnerships and the way forward. The side event took place on Wednesday, 3 September at the UNSIDS venue. Mr. Haoliang Zu, UNDP Director of Regional Bureau for Asia Pacific.